I've been spending a lot time with Cherry this past month, gearing up for the next Children's Classics Mystery Challenge. It's been delightful and fun to revisit this particular character. Cherry Ames Student Nurse is the first book in the series and one that I've only read recently, having ordered it so that I could read it and see where Cherry began with her nursing career. I'd read several titles that came later in the series, but never the first. It was fun for me to see where Cherry got her start. We find Cherry on her way out the door of her family's home to go to nursing school. The story is set during World War II when there was a great need for nurses and Cherry felt called to the profession both by gifting and by patriotic desire. Her family cheers her on, especially her twin brother, Charlie, who has his own dreams of enlisting and becoming a pilot. The Ames home environment is solid, stable and loving and Cherry is confident and challenged to go off and be the best nurse that she can be. This first title is not a mystery, per se. There is a doctor on the hospital staff where Cherry is training that is rough, gruff and is obviously keeping a secret from the entire hospital staff. There is a mysterious patient that is being treated by said doctor. But the mystery is not really glaringly obvious like some of the future Cherry Ames titles. Unlike Nancy Drew, who is immediately launched into detective work, it grows on Cherry over time. Wells wrote the first six books in this series and they are all set during World War II. 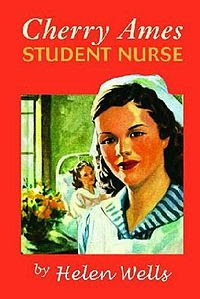 The main theme in these first books is American patriotism and a devotion to the field of nursing. Originally these books were published by Grosset & Dunlap but Springer Publishing picked up the rights and re-released the entire series. An interesting thing to note is that Springer Publishing's line consists of medical-related books entirely. The Cherry Ames series editor, Harriet Shulman Forman, RN, Ed.D., who obtained the rights for Cherry Ames, writes in her introduction that Cherry Ames directly influenced her own desire to enter the field of nursing. Any number of young ladies were inspired by Ames to do the same, including my friend's mom (who frequently leaves comments around these parts!). Cherry's morals and devotion to doing the best in completing one's duties is second to none. She's almost be the "goody two shoes" type but Cherry also has a penchant for being silly in a desire to make her patients laugh - even if she is breaking rules to do so. I think Cherry is an admirable character and a good addition to the world of children's mysteries because she is so different. She is career minded (unlike our other teen detectives who aren't really directed in any particular way). Like the rest of "the gang", Cherry loves people and loves to see what is good, noble and right carry the day. For my part, I really love Cherry and hope you'll consider giving her a chance, if you've never done so, or will seek her out again if you have. In the meantime, you've got a few days to get your posts ready for the next round of our Children's Classics Mystery Challenge which is coming up next Tuesday! It's a monthly "commitment" so you can jump in at any time. Really though, more than a commitment, it's just an encouragement for you to spend time with old friends. Because sometimes old friends are worth catching up with! I have read this -- and probably one of the original copies. My husband's grandparents had this book and Senior Nurse (my mother-in-law's copies from growing up), so I read them there. I remember liking them, and was surprised when you mentioned Cherry Ames as a mystery, since I didn't remember it being mysterious! I keep forgetting to look for Cherry at the library! And I was JUST there!!!! I remember reading this around middle school age, probably a 1960's copy.